Dust seems to be a package deal when it comes to tile cutting, doesn’t it? Even with all the professional tile tools you have in your arsenal, you still don’t seem to keep the amount of dust you create during a project under control. And, although you’ve got accustomed to it, dust can be extremely dangerous. Zero dust technology is the key, right? Sure, tile installation is messy, noisy, and possibly hazardous, especially if you don’t have the right equipment. But, that should no longer be an excuse. After all, one of the biggest risks you may face on the job has to do with the amount of dust to which you expose yourself. Incomes RUBI’s new line of zero dust saws, a groundbreaking concept that may significantly reduce airborne dust and prevent diseases related to silica inhaling. Are you curious to learn more about it? Let’s dive straight into it then! There are many possible health risks professional tilers and homeowners can be subjected to because of tile dust. Here’s the thing: ceramic tile is made of clay and other minerals. When a tile saw is used to cut it, these minerals become airborne, and you can easily inhale them if you’re exposed to them. That poses a great threat to those who have asthma or other respiratory issues. While you may wear protective gear to minimize exposure to dust, it is possible for particles to remain in the air even after cleaning. As such, homeowners, and particularly small children can inhale these particles and get sick. Breathing in tile dust can have a lot of adverse effects on the respiratory system, as the airborne particles can affect lung tissue when inhaled. Additionally, specific materials can break when they come into contact with various tile tools, and fragments can enter the eye and cause injuries or infection if you are not wearing protective goggles. The dangers of dust have been known for a long time, and many tilers and construction companies have adopted a series of precautions to minimize hazards, protect tilers and homeowners, and create a safe exposure. For instance, tilers must wear protective gear when cutting or removing tile – both masks and goggles. Once they finish the job, they must use proper dust extracting equipment, such as wet systems to clean the project site. Have a professional dust control system to ensure a safe working environment. Even when the mandatory protective measures are in place, there is still a chance of being exposed to dust. That’s where the new RUBI tile saws can come in handy. The new Zero Dust line is a revolutionary concept that can drastically reduce the amount of dust and water thrown into the air. This type of technology is already fairly common in Northern Europe, as health and safety regulations in those countries mandate construction companies to provide homeowners and workers a safe working environment. Though not the norm in the U.S. yet, it is believed that this regulation will spread sooner rather than later. 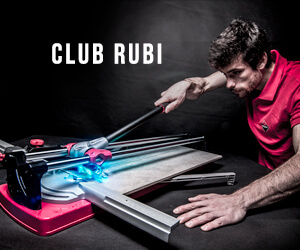 RUBI released the first electric tile cutter built in with the Zero Dust system after months of trials and tweaks to comply with health and safety regulation. The company even worked closely with the Netherlands Organization for Applied Scientific Research to ensure the line not only meets expectation but genuinely improves working conditions for tilers. What Is the Zero Dust Line? RUBI’s new Zero Dust line of tile saws aims to provide workers a safer professional environment. The system is exclusive to the company and was designed in collaboration with the TNO under the “Dust Free Working” program. The groundbreaking system reduces the number of breathable dust particles that become airborne when using different tile tools. That way, it can create a cleaner working space than any other tool on the market. The equipment from the new line can work up to three consecutive hours a day cutting ceramic tiles, and up to one-hour cutting natural stones. Whenever you use a tile saw, it will send dust particles chaotically into the environment, leaving users or bystanders exposed to them. A common practice was to use wet tile saws to control how these particles were released, trying to minimize its dangers. While it’s true that a wet tile cutter is safer than other tile tools, there’s no real guarantee that it will remove the risk element completely. With RUBI’s new zero dust system, not only is the amount of dust drastically reduced but the amount of water needed to use the equipment diminishes. That way you do not need to refill the tank constantly. RUBI’s zero dust line offers the first saw with the TNO certificate for cutting tiles and natural stones, a testament to the high quality of the product. Additionally, all products manufactured in the RUBI DC, DX, DS, and DR lines made from March 2017 will contain the zero dust system. The RUBI DC-250 line offers a high level of functionality and reliability, being the perfect tool for cutting glazed or porcelain tiles, and even natural stone. It contains two models: the 850 with a cutting length of 38.6* and 1200, with 47.4* inches cutting length. o Can be adjusted for angular cutting of larger pieces. The tool is perfect for working with bigger ceramic tiles due to its large work area and can provide better ergonomics, minimizing the risk of injury. The DX-250 PLUS Laser & Level models come with a plunge effect that gives users some versatility when performing cuts. Its 2 HP motor makes it the ideal tool to cut any ceramic tile as well as marble, bricks, granite and other building materials. o Includes a 2mW power laser tracer, allowing users to see when they are cutting tiles and better position the tools for precision. The DX-250 PLUS Laser & Level comes in two models: 1000 (with a maximum* cutting length of 44) and 1400 (a 59-¾ cutting length). In addition to the zero dust system, this line also comes equipped with a plunge effect as the DX-250 PLUS Laser & Level, giving great cutting versatility. It’s a great option when looking for precision and smooth cuts, as the motor offers more reliability when using the tool. o A spirit level system, allowing to install the tile saws at the work site. o It comes in two models: 1000 and 1300, with a maximum* cutting length of 46.7 and 58.5 respectively. This line offers highly accurate mobile heads that are a great solution for miter cuts. The DC-250-N Laser & Level tile saws have a powerful 3 HP motor for cutting and mitering tile, as well as various natural stones. Like other models offered by RUBI, these saws have a motor assembly integrated on the sliding bearing to ensure precision and smooth cuts. The DC-250-N Laser & Level tile saws have the most variety of the RUBI lines, coming in three different models: 1000 (40.16 cutting length), 1300 (51.97 cutting length), and 1500 (59.84 cutting length). At its core, the RUBI zero dust line of products is here to offer a safer alternative when it comes to our tile cutting jobs. As a professional tiler, you can easily understand why this line is so appealing. All the standard precautions you take in cutting tiles still aren’t enough to ensure no health risks. With these tools, you can keep dust levels under control, and, as such, you can ensure the safety of professional tile installers. Do yourself a favor and have one by your side on the job. *By using plunge effect first.